A few days ago I was a guest blogger, and I shared these wonderful Chocolate Frosted Shortbread Bites. Well, I wanted to share them with all of you also, so here they are!! These tiny cookies are the perfect little snack for mid morning or after school or pretty much any time! They have a deep buttery taste, and the little bit of chocolate provided a top layer of yummy flavor! I know you are going to love these simple treats! Hi everyone! 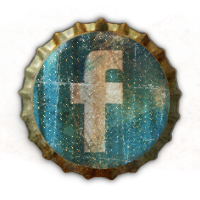 I am guest posting today over at Melissa's Cuisine. I made some shortbread cookies topped with chocolate frosting that I am sure you will love. They are easy to make and they make a great presentation! Plus, they are sooooo good! Stop by Melissa's and check out the recipe! Don't forget to congratulate Melissa on her beautiful new daughter! 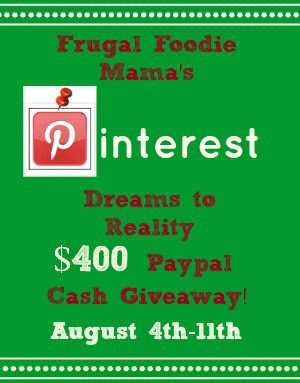 10,000 Pinterest Followers Cash Giveaway! 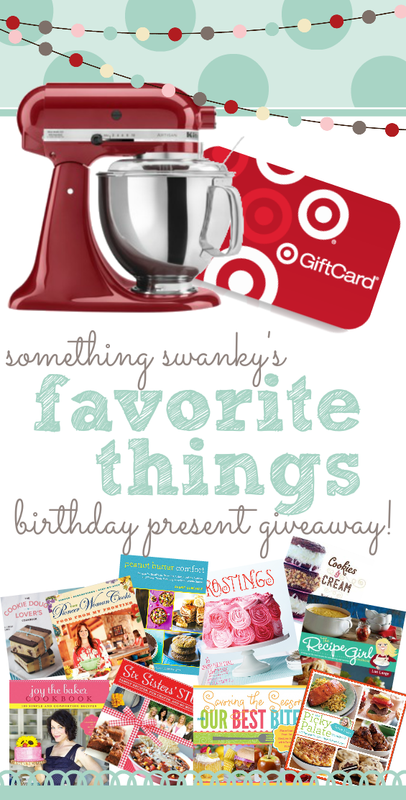 My friend, Carrie from Frugal Foodie Mama is having a great giveaway! The prize is cash!! What could be better than that? Don't hesitate. Enter today. This giveaway ends next Sunday!! 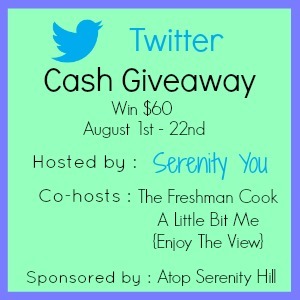 I am happy to announce the Twitter Cash Giveaway! 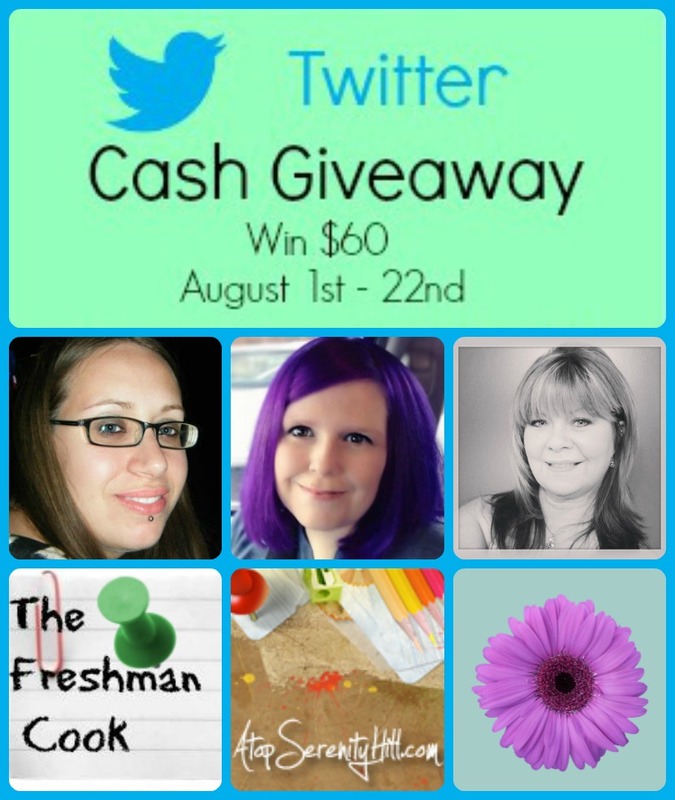 and she is celebrating with a cash giveaway. Do you like Biscoff? I just love it! I keep waiting for the time I am grocery shopping, and I don't buy 2 jars! I think it is clearly on it's way to being an obsession for me. So I guess I will have to feed this craziness until it stops. It's the only thing I can do! 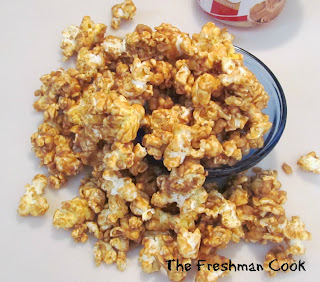 :) I am also loving toffee and popcorn right now, so I thought I would put them all together, and make the ultimate treat! So, yum! Pop your popcorn, 1 bag at a time. It is easier to control when you are mixing the popcorn. Mix the biscoff and 1 bag of popcorn together. After the first bag is mixed together, add the other bag in. Add the toffee bits and mix in. 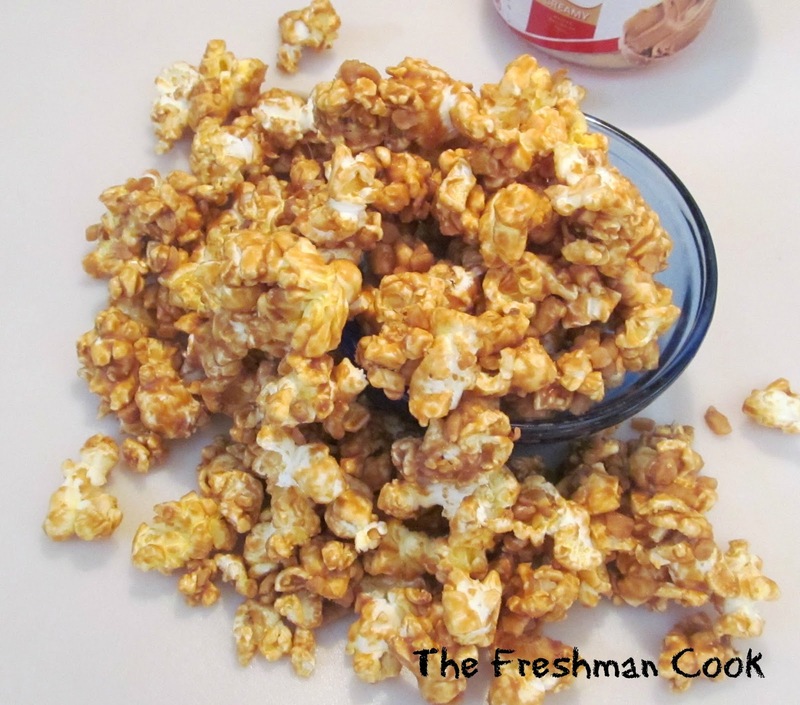 Spread the popcorn into a large pan, spread it out so it can dry. After it is dry, munch out and enjoy! 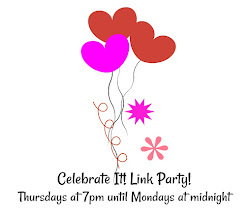 Today is the start of the biggest and best multi blogger giveaway I have ever been involved in! she would like to receive! 10 different cookbooks written by bloggers!! It's 4th of July! One of my very favorite holidays. I hope you have something fun planned. These cupcakes are easy and quick and they will fit perfectly into your holiday menu! I had fun using the Twizzler red, white and blue licorice strings to decorate. In a medium bowl stir together flour, baking powder, baking soda, and salt; set aside. Bake for 20 to 25 minutes. Cool thoroughly on racks. In a mixing bowl, place the warm water and the meringue powder. Add the cream of tartar. Whisk for 30 seconds more. Mix on low speed for 10 minutes. Cover with towel to keep frosting fresh. Color 1/3 of the cake mix red, and 1/3 of the mix blue. Cut your licorice into small pieces. Top each mini cupcake with frosting. Top each cupcake with pieces of the licorice. Got Ground Beef ? You've got a Meal! 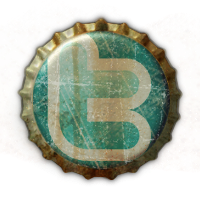 This post is courtesy of Instawares food and restaurant blog. It’s 6:30 p.m., and you’ve just come home from work. The kids are hungry. There’s nothing to prepare. Or is there? If you’ve got ground beef, you’ve got a meal, even if there is little else in the pantry or refrigerator. You might also try these ideas when you have plenty of unique ingredients on hand; your next super-secret, family favorite recipe might be just around the corner, since these recipes encourage substitution and experimentation. If you have tomato products available, try hamburger soup -- it’ll take the chill off even the coldest winter day. A rich and hearty meal, its preparation is simple: grab a pound (or more) of hamburger meat, brown it in a skillet, then throw it in a large pot. Add a liquid base. Tomato sauce, about five small or two medium cans, works well. So does a medium can of crushed tomatoes or tomato paste mixed with the same amount of water. You can even add two cups of water and a couple of freshly diced raw tomatoes. Bring the soup to a simmer and add vegetables, either canned or fresh. Potatoes, green beans and peas work well, but almost anything you have on hand is fine. Serve alone or with crackers, sliced bread, corn bread, or biscuits. You need very little to throw meatballs together. Add an egg and a quarter cup of breadcrumbs to each pound of meat you have, shape into balls, and place in a skillet to brown. And if you don’t have eggs, omit them and the breadcrumbs, then shape and brown. Create a sauce while the meat is browning. Start with a cup of catsup and add a quarter cup of soy sauce, a dash of Worcestershire sauce, and a quarter cup of brown sugar. Missing ingredients? Start with the catsup and build a base to taste using ingredients found in your refrigerator, such as sweet mustard, steak sauce, or whatever is on hand. Place the meatballs in the sauce and simmer until they’re cooked through, about 20 to 25 minutes. Serve with a vegetable and potatoes or buttered noodles. You might not keep hamburger buns in the house, but you can still serve hamburger patties. Prepare and season your meat mixture, either with egg or without, then halve it. Create the same number of patties from each half. Now, get creative. Place cheese, cream cheese, jalapeños or olives on one half, then place the second half on top and seal by pinching the edges together. Cook the patties on the grill or in a skillet, being careful not to break them open. Serve with a salad, mashed potatoes, chips or vegetables. With seasoning, an egg, and ground beef, you can have meatloaf. Mix a pound and a half of meat, an egg, a quarter cup of breadcrumbs (optional) and seasoning in a bowl. Line a medium-sized loaf pan with two slices of bread, which will soak up some of the grease for a leaner meal. Place the meat in a loaf pan and cook for 50 to 55 minutes at 350 degrees. Top with plain catsup or catsup mixed with a touch of brown sugar and serve with vegetables, noodles or potatoes.